JP's Music Blog: CD Review: Former BoDeans Singer Sam Llanas Is Up At "4 A.M."
CD Review: Former BoDeans Singer Sam Llanas Is Up At "4 A.M."
Former BoDeans front-man Sam Llanas is ready to release his second solo album entitled "4 A.M." The album is due on October 25 and will be released through Inner Knot Records. Llanas left the band he started this past year due to "differences of option" that had been "going on for years" as fellow BoDeans founder Kurt Neumann had stated. Now on his own, Sam Llanas decided to go back to his roots in song-writing with this mostly acoustic album. Right from the album's opening track "Oh, Celia" you notice a roughness in Llanas' voice. This only enhances the songs overall appeal and works well against the backdrop of acoustic guitars. Some of the songs found on this album were actually written and recorded with the BoDeans, but were instead stripped down and rerecorded for this album. The song "Nobody Luvs Me" was changed totally from what the original song sounded like, but the wonderful lyrics draw more meaning in this type of setting. The other BoDeans' song on this album is "Shyne" which appeared on last year's "Mr Sad Clown." Llanas also covers Cyndi Lauper's "All Through The Night" which fits in perfectly with the album's overall appeal. The gentle, frailness in his voice fits the mood of the mellow sound of "The Only One," before closing the album with the stories lyrics of "The Way Home." 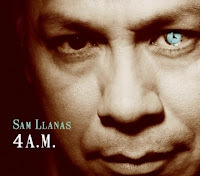 For more information on Sam Llanas new album "4 A.M." please visit www.conqueroo.com/samllanas.html.